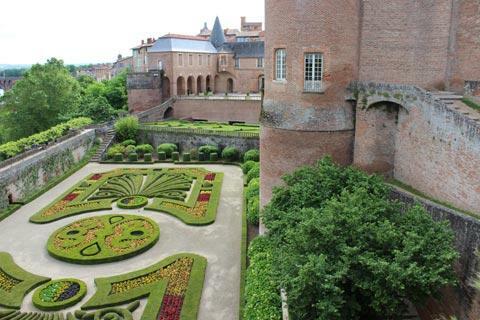 Best known as the capital of the Tarn department, the bustling medieval city of Albi is a fascinating and lovely city to explore with a great deal of historic interest to be seen. 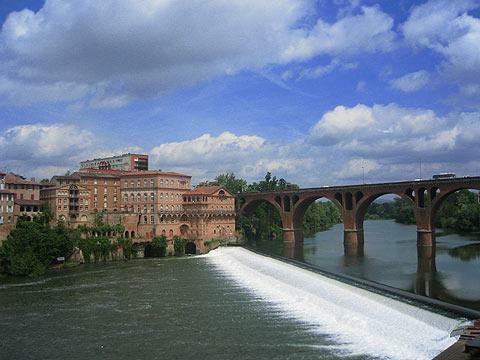 A visit to Albi is also interesting if you are intrigued by the recent revival of interest in the Cathars’ history as the city was an integral player during this period. The origins of the city date back to pre-roman times although most of what we see today dates from the medieval period and more recent centuries: for example, the Palais de la Barbie was built in the 13th century and the Cathedral was constructed during the 14th and 15th centuries to celebrate the Catholics recapturing the town from the Cathars. 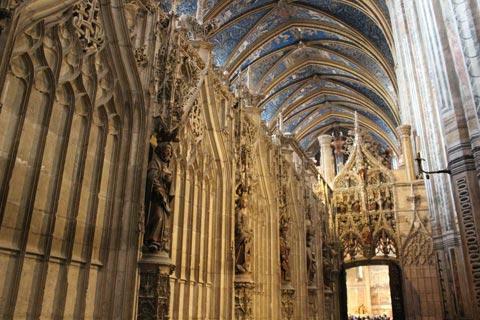 Emerging from Medieval times, Albi had a period of prosperity as a result of the ‘bleu du Cocagne’, a beautiful blue pastel colour made from a local plant that brought great wealth to the pastel merchants who in turn invested this wealth into the city. More recently, the city survived both world wars relatively unscathed and following recent redevelopments of the Cathedral square and the covered market the old town is now one of the largest conservation areas in France. 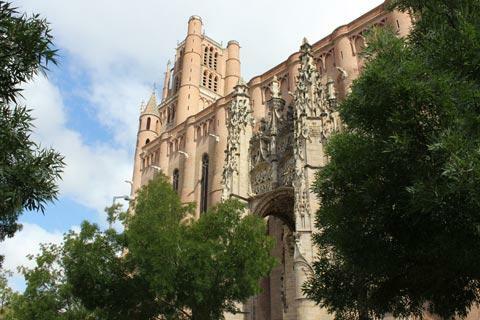 If you are arriving by car I suggest you head straight for the town centre and towards the imposing cathedral of Sainte Cecile. Here you will find a large car park which drops down below underneath impressive railway arches. If you park at the top you have to pay but if you continue down the parking is free and you can stay all day. Walking back up the hill you come out right next to the Cathedral in the heart of the city. Your first stop should be Albi Tourist office, to the left of the Cathedral Square and next to the Toulouse Lautrec Museum. Here you can pick up all sorts of useful literature including the Albi Pass (6,50 euros) which gives you free entry into the Toulouse Lautrec Museum and into the Cathedral nave (these two attractions alone cover the price of the pass) and then also get various other deductions and offers including discounts on river trips, other museums, certain shops and restaurants. 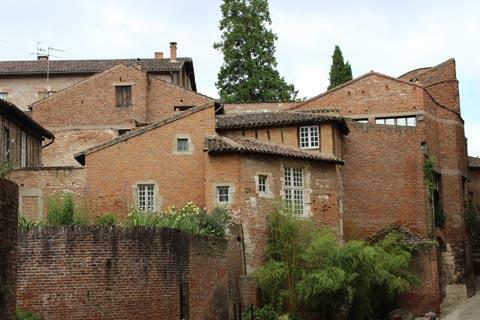 If you enjoy sightseeing you will be spoilt for choice and just by walking around the labyrinthine old town of 'La Vieil Albi', which is pedestrianised, you will see a whole variety of architecture and fascinating buildings. 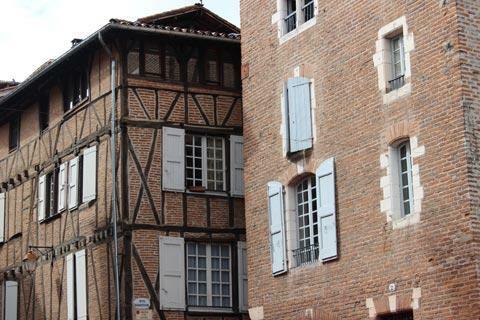 Many of the medieval houses and other buildings are in the lovely red brick that is very famous in the region around Albi and Toulouse. 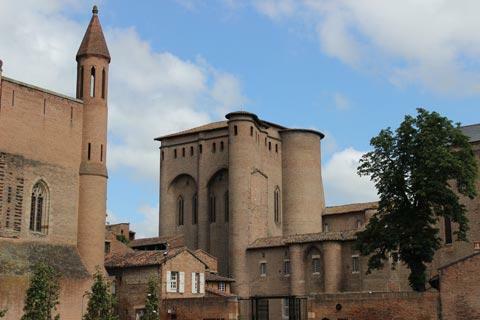 If you prefer a more formal visit to ensure you see as many highlights as possible Albi tourist office suggest six different walking tours. 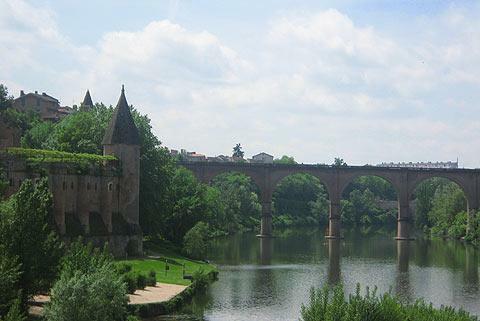 The hidden gardens walk is one of my favourites, another is L’Echappée Verte – 3 walks of one kilometre each through the heart of the city and based on the banks of the Tarn River. In the heart of the old town, the Cathedral of Saint-Cecile is impossible to ignore with its austere redbrick façade and grandiose dimensions dominating the town centre. 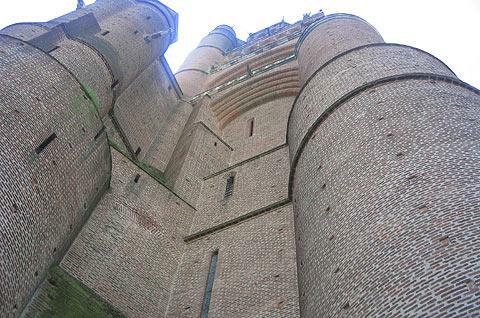 The cathedral was built over an extended period, from 1280-1492 and is in a style called ''southern Gothic'. On the outside of the cathedral the elaborate carving of the entrance on the south side is the highlight, but for me the biggest surprise is that it inside this dour exterior lies the most incredible painted interior imaginable. Next to the Cathedral is the Berbie Palace. 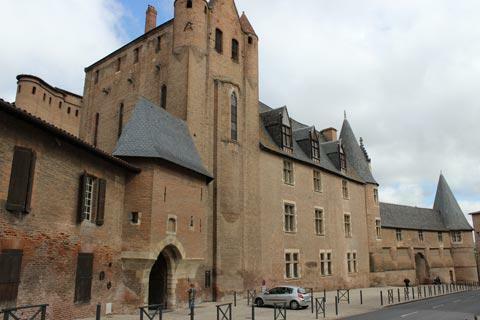 The palace predates the cathedral and it was from here that the bishop ordered the construction of the St Cécile Cathedral in 1282 following the persecution and expulsion of the Cathars. 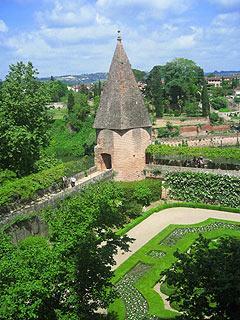 Today in the Berbie Palace you can visit the Toulouse Lautrec Museum. As Lautrec was born in Albi you will find lots of references to him throughout the city and the museum has a very large number of his artworks. 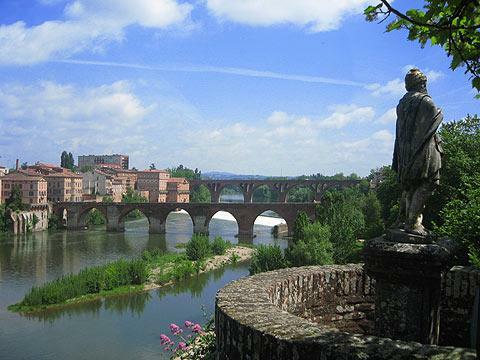 No tour of Albi old town would be complete without also strolling to one of the many viewpoints which overlook the river and bridges in the heart of the town. If you love to shop then you will also find lots to please you here. In Albi old town there are boutiques and stores covering every possible need. Markets are held regularly with ‘themed’ markets occurring throughout the year. The newly developed covered market in the centre of the town is well worth visiting as it has been beautifully restored. Because Albi is a departmental capital it is possible to find events all year around with theatre and music concerts (often open air) held on a regular basis. Annual events which are well worth attending if you are around at the right time, are the February Carnival with a parade of floats and a visiting fair, the July Pause Guitare , which hosts a large number of folk and traditional French musicians. The firework display for Bastille Day (July 14th) where the fireworks are set off between the two main bridges spanning the Tarn, and the Christmas Market held in December in the square in front of the cathedral are also popular local events. 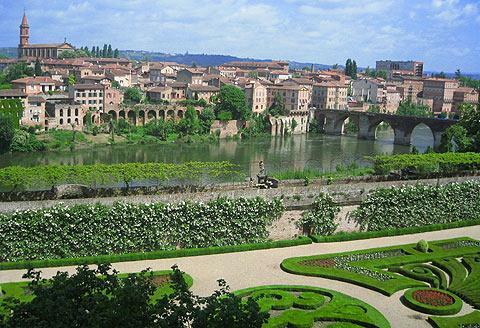 Albi is classified as one of the important French Historic Towns. 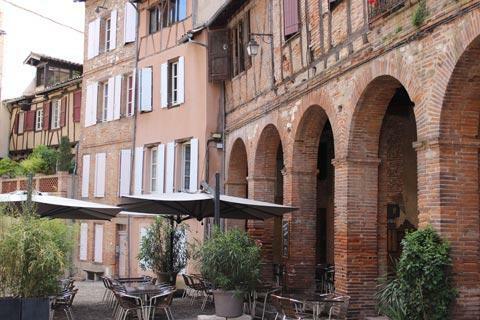 Albi is also a superb place to visit to eat out. There is a huge choice of restaurants, and generally the quality is good. There are many cheap and cheerful ‘Menu du Jour’ restaurants around the Cathedral, but you can also find some super fine dining too. Three restaurants I have visited and can recommend are: le Lautrec housed in the converted stables of the house where Lautrec was born, excellent food with superb service, La Table de Sommelier which offers set menus built around red or white local Gaillac wines, and the L’Espirit du Vin, which is not a cheap option but well worth it for a special occasion. 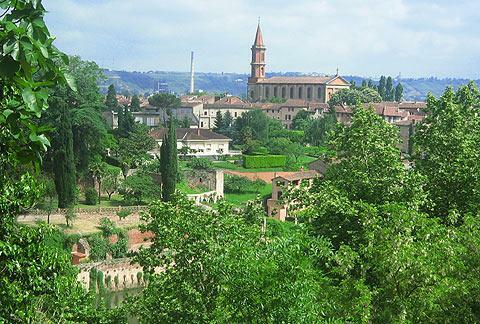 Among the most popular attractions nearby are the lovely village of Cordes-sur-Ciel, north-west of Albi, and also the riverside town of Gaillac to the south-west, where you can see more of the red-brick architecture typical to the region.